Swastikas painted around Torah ark in Jerusalem synagogue, holy books burned. Congregants at a Jerusalem synagogue were stunned Wednesday morning to find the house of prayer had been vandalized, with swastikas painted on the walls and multiple holy books set on fire. 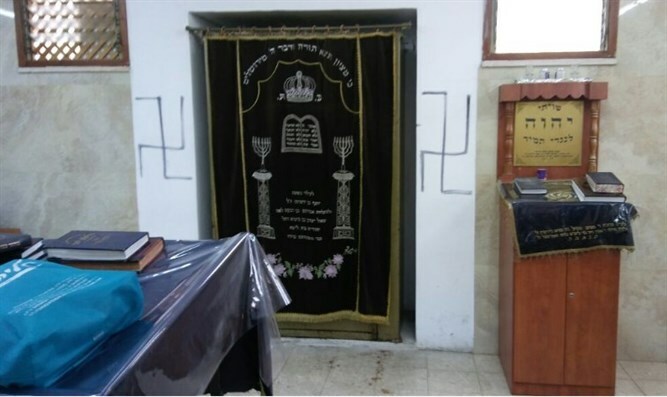 Worshippers in the Makor Baruch neighborhood in western Jerusalem found four swastikas painted on the walls of the Lelov synagogue, including two alongside the synagogue’s Torah ark. 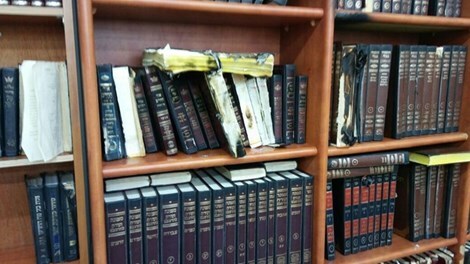 In addition, three religious books were removed from synagogue’s book shelves and singed when the vandals apparently attempted to set them on fire. The synagogue belongs to the Lelov-Nikolsburg Hasidic dynasty, and serves as the study hall of Rabbi Pinchas Yitzhak Biderman and his students. Police were notified of the vandalism, and a unit deployed to the scene. Officers discovered swastikas painted on nearby apartment buildings. Shas chairman and Interior Minister Aryeh Deri said he was “horrified” by the incident.